IPPO poll on 17 May 2017, two days before the presidential election, show that both Hassan Rouhani and Ebrahim Raisi’s votes are on the rise. If the pattern of participation and voting on Election Day is similar to the pattern represented on the May 17th poll, Hassan Rouhani will win in the first round of voting (Iran’s electoral system is a two-round system). The results show that 63% of those respondents that say: 1) they will definitely or likely participate in the 19 May 2017 election and 2) are inclined to vote for one of the running candidates choose Rouhani as their first choice candidate. After Rouhani, Raisi is the runner-up with 32% of the votes. 5% of the respondents are still voting for candidates that have either dropped out of the presidential race, their names are not on the ballot or are or running elsewhere in other elections (see the above chart). If we take into account all the respondents that say they will probably vote on Election Day, still 16% of this pool are undecided and 20% of them do not wish to disclose the name of their preferred candidate (see the chart below). If we set aside those giving miscellaneous and irrelevant answers as well as the two aforementioned groups of the undecided voters and those who do not disclose their preferred candidate, on Election Day Rouhani will win with 63% and Raisi will be the runner up with 32% of the votes. These figures are the winning probabilities and they are produced from tracking polls and estimating. The estimate of the outcome of the election at this point is as such that Hassan Rouhani has 95% chance to secure 59% to 67% of the votes. Similarly, IPPO estimates that Ebrahim Raisi has a 95% chance to obtain 28% to 36% of the votes on 19 May. If within 48 hours to Election Day the current voting pattern is maintained then the IPPO calculations and estimations would hold true on Election Day. The voter turnouts that participants have mentioned have remained more or less steady in the past 10 days. However on 17 May 2017 the poll shows an increase in turnout as 77% of respondents say they are likely or very likely to vote on 19 May 2017 presidential election. In contrast, 12% say there is little chance or very little chance that they will participate in the elections. Besides the 7% of respondents that say they are somewhat likely to participate in the elections, 1% of the respondents have not yet reached a decision with regards to participation. In 2013 presidential election in Iran, the IPOS group polls announced a 78% voter turnout estimate. However, the actual voter turnout on Election Day was 73%. In light of 77% turnout rate of the respondents of IPPO polls in 2017, one can conclude that the actual turnout rate might be lower than this estimate and be around the actual figure from 2013; that is assuming that no major development occurs between 17 May and the Election Day on 19 May 2017. 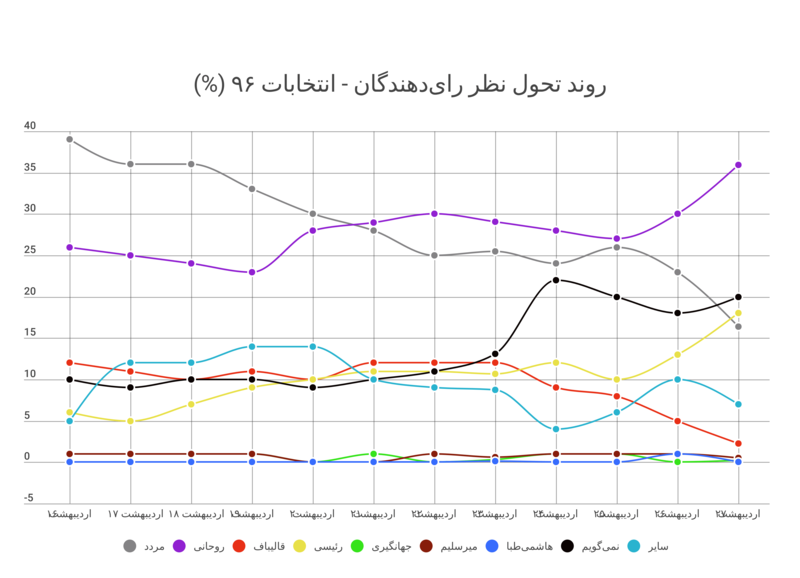 Subsequent to Mohammad Bagher Ghalibaf announcing that he has dropped out of the race, his votes among the respondents of the IPPO polls dropped. Those who continue to mention Ghalibaf’s name as their first choice candidate are respondents who are not aware of Ghalibaf’s withdrawal or respondents loyal to him that refuse to accept he is not on the ballot. The results from the past three days show that Ghalibaf’s vote on the 2nd day of his withdrawal decreased by 6% on 16 May to a total of %10 of the votes. On the third day after Ghalibaf’s drop out of the race, his votes decreased by a further 7% to %3 percent of the votes. That is to say that Ghalibaf’s votes from 14 May to 17 May dropped from 19% to 3% respectively. The 16% decrease in Ghalibaf’s votes as well as the decrease in the undecided voters corresponds to an increase of 7% to Rouhani’s votes and 16% to Raisi’s votes. In the past two days, IPPO interviewers asked respondents who selected Ghalibaf as their first choice candidate that in light of their candidate’s drop out, who they are going to vote for next. Responses obtained indicate that 30% of Ghalibaf’s votes are transferred to Ebrahim Raisi, 26% to Rouhani, 33% to the undecided pool and 9% are left void as respondents plan to not choose anyone other than Ghalibaf or they choose options not on the ballot. Considering that in the past two days Ghalibaf has had an average of 6.6% of the votes, the absolute value of number of votes that can possibly be transferred from the pool of Ghalibaf’s vote to Raisi and Rouhani are 2% and 1.7% respectively. The results show that voters are more determined to vote for Hassan Rouhani. 23% of respondents say that they will not vote for any other candidate, except for Rouhani. The figures for those who will not vote for any other candidate except for Ghalibaf and Raisi are 16% and 13% respectively. More so, 24% of those who chose Rouhani as their first choice are willing to vote for rival candidates Ghalibaf and Raisi. While 50% of Ghalibaf voters and 61% of Raisi voters are willing to vote for their first choice candidates’ opponent. Overall, of the 25% of voters who are voting for Ghalibaf and Raisi, 36% are willing to vote for Rouhani as the alternative candidate. 15% of respondents who have chosen Rouhani as their first choice say that if they do not vote for Rouhani, they will vote for Ghalibaf. In contrast, 20% of Ghalibaf voters say if they do not vote for Ghalibaf, they will vote for Rouhani. 11% of Rouhani voters say that if they do not vote for him, they will vote for Raisi; while 16% of Raisi voters choose Rouhani as their second alternative vote. Comparing alternative choices between Raisi and Ghalibaf’s voters: 44% of the Raisi voters choose Ghalibaf as their second alternative; yet 30% of Ghalibaf voters are willing to choose Raisi if they were not to vote for Ghalibaf. Overall, for 36% of the votes that Rouhani receives as an alternative candidate for Ghalibaf and Raiais, he gives %26 of his voters to the two opponents. In other words, the net balance of Rouhani’s votes in this category is +10%. Ghalibaf on the other hand receives only 50% of the voters from the pool of Rouhani and Raisi’s first choice voters while giving 59% of his voter to Rouhani and Raisi. In other words, the net balance of Ghalibaf’s votes, as a second choice alternative is -9%. Raisi also receives a negative balance of %10 percent. For every 51% of voters he loses to Ghalibaf and Rouhani in the second choice category, Raisi only receives 41% from the pool of Ghalibaf and Rouhani’s first choice ballots. This polling was carried out at a national level in Iran on May 17 2017. The interviews were conducted via phone. Interviewers were trained – both for general skills of phone polling and for the specific needs of this survey. The interviewers were selected post training after passing an interviewing skills exam. The sample size was 1203 Iranians, 18 years and older, who were residing in Iran and were selected randomly. Sampling methodology is a two-stage proportional sampling. It’s on the basis of each of the service operators’ market share and then simple random sampling. Assuming maximum variation, the results of this survey can generalize to the whole of the 18 years and older Iranian (resident in Iran) with a margin of error of ±2.83 to ±4.06 for the 95% confidence interval (based on responses to questions). The data were weighted based on the last available National Iranian Census (2011) with gender, age group and place of residence (urban/rural) as weighting variables. Farsi native speaking interviewers conducted the interviews during daylight hours, local time. The results of each interview was assessed twice by the interviewer and the supervising team – in terms of respondent’s trust in the interviewer and the interviewer’s assessment of the respondents’ honesty. Those respondents who had received very low scores for trust and honesty have been removed from the random sample.